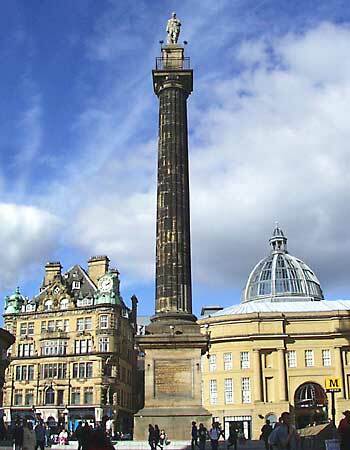 Greys Monument, situated at the junction of Blackett Street and Grey Street. Location: Grey Street/Blackett Street, Newcastle. Materials: Portland Stone and Gritstone. Status: Listed Grade I. The 134 ft coarse gritstone Roman Doric column, has the 13 ft Portland Stone statue of Earl Grey in robes standing on a pedestal, above a balcony reached by 164 steps within the column. The column was paid for by public subscription organised by a committee chaired by William Ord. The sculptor was also responsible for the figure of Lord Nelson on Nelson's Column in Trafalgar Square, London (1839-41).